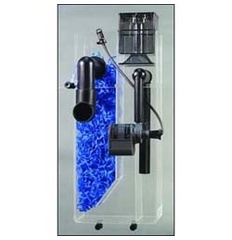 The BAK-PAK2 Bio-Filter is the second generation external, hang on the back, combination Protein Skimmer and Biological Filtration unit from CPR. The BAK-PAK 2, like the original, is designed for tank sizes up to 60 gallons. 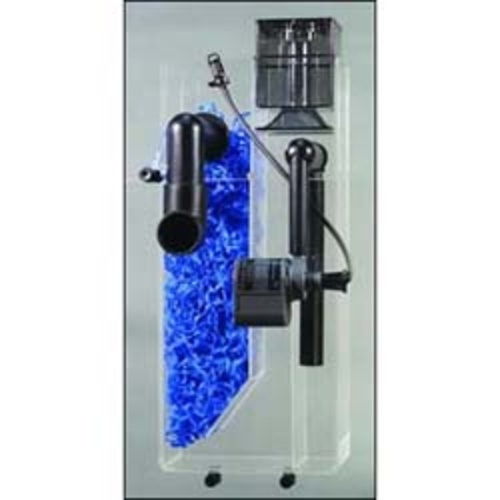 Water first enters the Protein Skimmer column from the aquarium and then flows through the biological chamber filled with Bio-Bale filtration media before returning to the aquarium. The Protein Skimmer is driven by an Accela rejuvenation venturi powerhead. Bubble dwell time is increased by the counter-current flow in the skimmer column. The quality of the foam collected can be controlled by raising and lowering the collection cup. To set up the BAK-PAK 2, hang the unit behind the aquarium and plug it in -- that's it. New improved design incorporates an easy to clean intake tube and an enclosed, directional outflow to reduce salt splash and micro-bubbles entering into tank. The new design also uses a smoke colored break-resistant collection cup.